Sometimes our birds get caught out in the cold despite our best efforts. Follow these six steps to help birds suffering from cold injury. November’s sunny warmth is sadly deceptive, lasting only hours before nightfall comes. Even though this happens every autumn, we’re often still taken by surprise by how short the days are now. My sons will have only just settled down to homework or I’ll have only just started preparing dinner when we suddenly realize how dark it is. We drop everything in order to lock everyone safely into their coops for the night. In our area, there are simply too many nocturnal predators to slack even a little. This is why a recent experience involving one of my chickens stunned me. After being out late one Friday night, I was up before dawn for a local Turkey Trot running event. When I returned home, I found my 15 year old, Jaeson, sitting in the kitchen, snuggling a lumpy bundle in his arms. “I might have messed up my head count yesterday when I locked up,” he told me remorsefully. Turning, he revealed that his bundle was a very still Claudine Orpington. Frost covered her wings and the feathers of her face, which had turned from pale lavender to dark purple. Only the occasional blink of her eyes told me she was still alive. Amazingly, she was unscathed by predators. Cold-hardy chickens, with their high body mass and small wattles, earlobes and combs, are extremely tolerant of winter’s bone-chilling conditions. That said, they do have their limits. Stuck outside all night, without flockmates to share body warmth and shield her from the fierce wind and constant snowfall, Claudine could have easily perished. Instead, she quite possibly saved her life by putting herself into the energy-conserving trance in which Jaeson had found her. 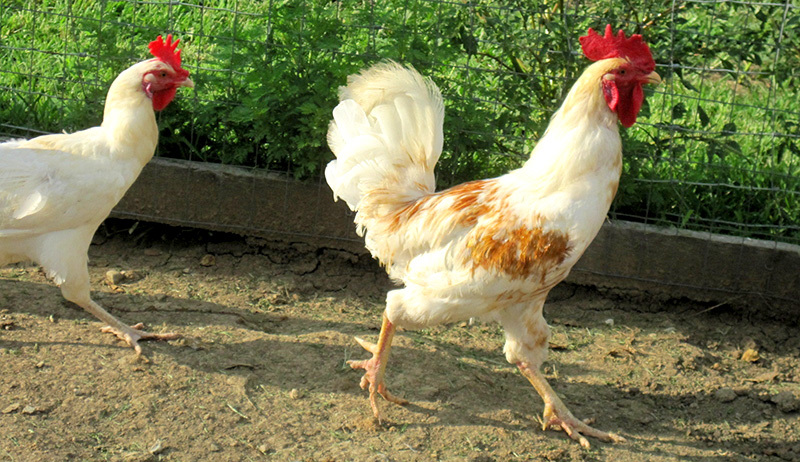 If you accidentally lock one of your birds out of its coop overnight during the winter—or if a couple of hens linger too long outside, missing the closing of your coop’s automatic pop door—follow these steps to help ensure your chicken’s survival. Move your chicken immediately into a sheltered location, out of the weather. This can be a shed, a barn, a garage, even your house, any place where the indoor temperature is substantially warmer that outdoors. Carry your bird carefully to avoid injuring its wings and potentially frostbitten body parts. Whenever I come in from the cold, the first thing I want to do is wrap myself up in a nice, warm blanket. The same holds true for a chilled chicken. Wrap your somewhat frozen fowl in a sturdy length of fabric, creating an additional layer that adds and retains heat. Using a towel or a wicking material has the added benefit of absorbing water from ice melting off frost-covered feathers. Be sure to dab moisture gently off your bird’s face and extremities. Do not use a hair dryer, heat lamp or any gadget that directs heat or hot air, as this can severely damage cold-injured tissue. Standing in snow in subfreezing temperatures for hours is an open invitation to frostbite. 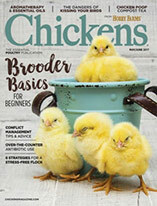 Your chicken’s toes might appear darker than usual in color; they might also be stiff and immobile, as were Claudine’s. In either case, do not rub the feet to generate warmth. Friction of any sort can burst capillaries and cold-damaged cells. To get blood circulating again, place your bird’s feet in a container of lukewarm, not hot, water (anything hotter than room temperature can further damage those injured tissues). Every few minutes, check for flexibility. Be sure to keep the water from cooling. Once your bird can grip your fingers with its toes, you can discontinue this treatment. Being out in the cold all night can cause dehydration as well as stress. Combat these debilitating conditions by offering your feathered patient water mixed with electrolytes such as Sav-a-Chick. This water should also be lukewarm. Your bird might not be interested in drinking—or be able to drink—at first. Continue to offer water every 10 to 15 minutes until she starts drinking on her own. Once your chicken warms up, alertness and hunger will increase. Be prepared by having a bowl of food ready. Regular rations are perfectly fine to offer, but a warm mash makes a welcome, comforting and nutritious recovery treat. To prepare your mash, combine adult rations with warm water and stir until it is the consistency of a slurry or porridge. For extra protein, add crumbled dried mealworms, finely chopped sunflower kernels, almond meal or a cooked (and cooled) scrambled egg. Do not force your bird to eat; he will eat when he is ready. While frostbite is most likely to occur in a moist, poorly ventilated coop, a night outside in wintry weather can also cause potentially permanent damage to your bird. Exposure can cause the soft tissues to plummet in temperature to the point where the fluids within freeze and expand, bursting and destroying the cells. Like severely chilled tissue, frostbitten tissue will appear off color. The frostbitten areas—usually extremities such as wattles, comb tips, toes and earlobes—will blacken and fall off. 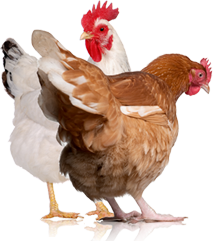 Chickens that have suffered from cold injury tend to be susceptible to it for the rest of their lives. To ensure their safety during the winter months, limit these birds’ exposure to severe cold. Separate them from flockmates who might peck at the damaged tissue until the injuries have fully healed (approximately six weeks). Ensure that the chickens’ coops are free of drafts and leaks, and that they’re well ventilated and have plenty of dry litter. And, of course, take an accurate head count when you lock up at night, even if it’s dark, windy and snowing at the moment. Claudine somehow managed to escape permanent harm after her night out. She warmed up very quickly, and her feet regained full range of motion swiftly—so much so that she kicked over the water container and ran off under the kitchen table. Last to return to normal was her facial color. Once this was back to pale lavender, and once she finished devouring her bowl of mash, she went back out to her flock. a full, proper head count ever since. Ana Hotaling and her husband, Jae, own FMA Farms, a heritage-poultry farm in Southeast Michigan. When not writing or chasing after chickens and children, Ana teaches martial arts and yoga and is a competitive triathlete and runner. 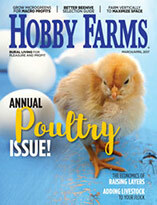 Follow Ana's poultry adventures at www.facebook.com/FMAFarms.